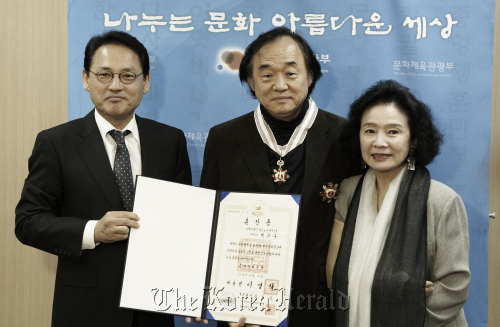 Paik Kun-woo, a renowned Korean pianist residing in Europe, was awarded the Eun-gwan (Silver Crown) Order of Cultural Merit from the Culture Ministry on Monday. The Eun-gwan Order of Cultural Merit is the nation’s second-highest honor for contributions to culture. Born in Seoul in 1946, Paik gave his first piano concert at the age of 10 with the Korean National Orchestra in Seoul. Having studied at the prestigious Juilliard School of Music in New York, Paik has been performing with the world’s most acclaimed orchestras including London Symphony Orchestra, Orchestre National de France and Pittsburgh Symphony. Paik’s honor follows that of his wife Yoon who won the Best Actress Award at the Daejong Film Awards for her highly-acclaimed performance in “Poetry” on Friday. Yoon also participated as a jury member at the Mumbai Film Festival last week. The star couple met in Paris, France, in 1974 and got married in 1976. On supporting young artists in Korea, Paik said there should be more support from the government. As for himself, he is not sure if he wants to get into teaching. “I’ve been always skeptical about “teaching” piano because one has to find his own “language” in himself to play that instrument,” he said. “But I think there should be more systematic support from the government for the young who want to pursue a career in music.”After all, it takes a lot to create good music: talent, personality, but most of all, being genuine, Paik said.